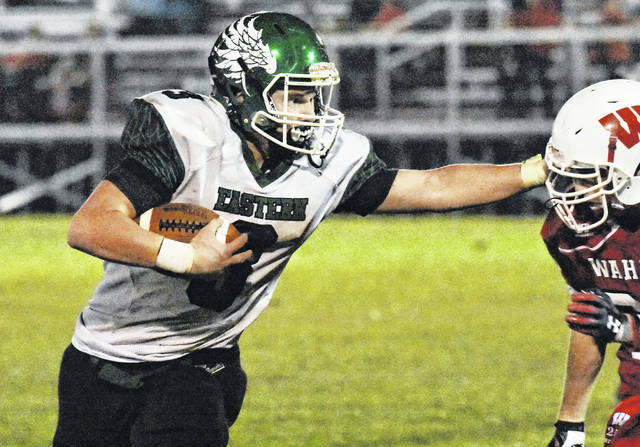 Eastern’s Steve Fitzgerald carries the ball during the Eagles Tri Valley Conference Hocking Division contest against Wahama on Sep. 28 in Mason, W.Va.
Last Week: Miller lost to Trimble 49-0, in Hemlock; Eastern defeated Federal Hocking 35-0, in Stewart. Last meeting between the teams: Sept. 1, 2017. Miller won 30-0 in Hemlock. Current head-to-head streak: Miller has won 3 straight. MHS offense last week: 43 rushing yards, 13 passing yards. EHS offense last week: 273 rushing yards, 47 passing yards. MHS offensive leaders last week: QB Blayton Cox 5-of-6, 13 yards, 1INT; RB Blayton Cox 17 carries, 30 yards; WR Jtkab McClain 2 receptions, 1 yard. EHS offensive leaders last week: N/A. MHS defense last week: N/A. EHS defense last week: 32 rushing yards, 30 passing yards. 1. In the past 22 years, EHS is 12-10 against the Falcons. Only six of the 22 contests have been decided by one score or less, including the Falcons’ last trip to East Shade River Stadium, which resulted in a 21-14 MHS victory on Sept. 2 2016. 2. Eastern has shut out back-to-back teams for the first time since blanking blanking Green and Federal Hocking in back-to-back seasons. The Eagles have won three straight games, matching their longest winning-streaks from the last two seasons. 3. Only one of Miller’s two victories count toward its OHSAA ranking. The Falcons’ most recent victory, a 30-20 win at home over Middletown Christian, as the Eagles are a club team. 4. So far this season, Miller and Eastern have three common opponents, in Trimble, Waterford and Wahama. The Falcons defeated Wahama 40-0, while Eastern claimed a 42-0 win at Wahama. The Tomcats and Wildcats defeated Miller by a combined 90 points, while besting Eastern by a combined 65. 5. Eastern is the 13th ranked team in Region 27, where the Falcons are 19th. EHS is one of four teams in the region with three wins, while MHS is joined by five other one-win teams. Last Week: Southern defeated Ravenswood 35-19, in Ravenswood; Waterford defeated Wahama 44-0, in Waterford. Last meeting between the teams: Oct. 13, 2017. Waterford won 14-6 in Racine. Current head-to-head streak: Waterford has won 4 straight. SHS offense last week: 129 rushing yards, 261 passing yards. WHS offense last week: 224 rushing yards, 121 passing yards. SHS offensive leaders last week: QB Logan Drummer 19-of-33, 261 yards, 4TDs, 2INTs; RB Trey McNickle 15 carries, 80 yards; WR Trey McNickle 5 receptions, 77 yards, 1TD. WHS offensive leaders last week: QB Peyten Stephens 8-of-9, 111 yards, 2TDs; RB Braden Bellville 14 carries, 173 yards, 2TDs; WR George Pantelidis 4 receptions, 39 yards, 2TDs. SHS defense last week: 269 rushing yards, 26 passing yards. WHS defense last week: 1 rushing yards, 110 passing yards. 1. The Wildcats are 17-5 against SHS in the last 22 meetings between the teams. WHS has claimed victory the last two times Southern has visited, with the last Tornado win in Waterford coming on Oct. 12, 2012 by a 21-0 count. 2. Last week, the Purple and Gold had a pass intercepted for the first time since Week 8 of last season. Southern was also held without a rushing touchdown for the first time since Week 7 of last fall. 3. Through seven weeks, Southern’s defense has only allowed 225 passing yards. The Tornado defense has 15 takeaways and has a trio of touchdowns this season. 4. SHS signal caller Logan Drummer has thrown 17 touchdowns this year, while rushing for five. Tornadoes junior Trey McNickle has caught a team-best seven of the scoring passes, while rushing for a dozen more. 5. Southern and Waterford enter Week 8 at spots six and seven respectively in the Region 27 playoff standings. Just 10 teams in the region enter the week with a winning record. SHS is one of only three six-win teams in the region.